The sales at Beltane Farm were respectable! Always great to meet and greet new people and customers. I had a few people interested in a PMC class, so we will be forming one of those. Great! The orders are pouring in from my Etsy site! I love the way the universe works....I have been remembering to TRUST that asI put my work out there, I will build my business and it will be successfull in all the ways that I would like it to be! Well, guess which necklace was special ordered yesterday. Yes! 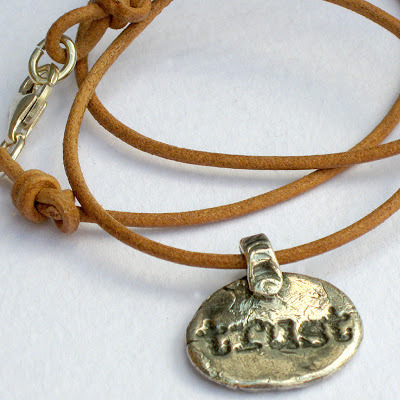 My handmade fine silver (pmc) pendant with the word 'TRUST' on it. I love it! And, no, not just one was ordered, but 4! So I laugh and say, "Ok, ok, universe, God, light, the energy around -- whatever we call it -- I get it, I get it!" The 'law of abundance' and all of that... it does take practice to trust it because it is certainly not the mainstream of thinking; but I am telling you it does work. Have a great day. Another gorgeous one here in New England! 65 degrees in November!